The new Ocular Dynamic Contour Tonometer (DCT), investigational device supplied by SMT (Swiss Microtechnology AG, Switzerland) allows simultaneous recording of intraocular pressure (IOP) and ocular pulse amplitude (OPA). It was the aim of this study to compare the IOP results of this new device with Goldmann tonometry. Furthermore, IOP and OPA measured with the new slitlamp-mounted DCT were compared to the IOP and OPA measured with the hand-held SmartLens®, a gonioscopic contact lens tonometer (ODC Ophthalmic Development Company AG, Switzerland). Nineteen healthy subjects were included in this study. IOP was determined by three consecutive measurements with each of the DCT, SmartLens®, and Goldmann tonometer. Furthermore, OPA was measured three times consecutively by DCT and SmartLens®. No difference (P = 0.09) was found between the IOP values by means of DCT (mean: 16.6 mm Hg, median: 15.33 mm Hg, SD: +/- 4.04 mm Hg) and Goldmann tonometry (mean: 16.17 mm Hg, median: 15.33 mm Hg, SD: +/- 4.03 mm Hg). 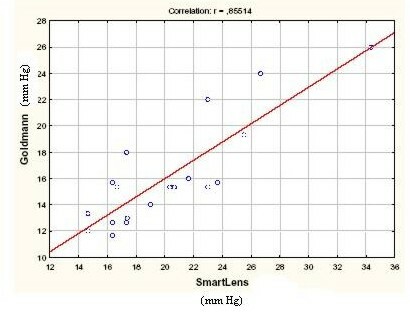 The IOP values of SmartLens® (mean: 20.25 mm Hg, median: 19.00 mm Hg, SD: +/- 4.96 mm Hg) were significantly higher (P = 0.0008) both from Goldmann tonometry and DCT. The OPA values of the DCT (mean: 3.08 mm Hg, SD: +/- 0.92 mm Hg) were significantly lower (P = 0.0003) than those obtained by SmartLens® (mean: 3.92 mm Hg, SD: +/- 0.83 mm Hg). DCT was equivalent to Goldmann applanation tonometry in measurement of IOP in a small group of normal subjects. In contrast, SmartLens® (contact lens tonometry) gave IOP readings that were significantly higher compared with Goldmann applanation tonometer readings. Both devices, DCT and SmartLens® provide the measurement of OPA which could be helpful e.g. for the management of glaucoma. Determination of the intraocular pressure (IOP) is an important feature in the diagnosis and management of glaucoma. This approach, however, has limitations and its effectiveness has been questioned in literature [1–3]. Furthermore, there is evidence that the ocular pulse amplitude (OPA) could play a role in the clinical course of glaucoma [4, 5]. The OPA is an indirect indicator for the choroidal perfusion and reflects the ocular blood flow corresponding to the heart pulse as a function of time. A reduction of the blood flow may cause hypoxia and further cell death and therefore may also initiate diseases like glaucoma and maybe other circulatory problems. In different studies the effect of local glaucoma therapy on ocular hemodynamics is determined using different instruments for IOP- and OPA-measurements [4, 6–15]. The measurement of the IOP with Goldmann tonometry is probably the most common method but it has been shown that IOP measuring is affected by changes in the central corneal thickness [16–20, 1, 2, 6]. The new Dynamic Contour Tonometer (DCT, supplied by Swiss Microtechnology) allows a recording applanation tonometry (IOP) and the simultaneous measurement of the ocular pulse amplitude. In comparison to the previously introduced SmartLens® from ODC (Ophthalmic Development Company, Switzerland) which is a gonioscopic, hand-held contact lens tonometer, the new Dynamic Contour Tonometer is fixed at the slitlamp. There are already recording applanation tonometers in clinical use like the Langham Ocular Blood Flow System (OBF). The technology of the OBF system including measurement of the OPA, pulse rate, and ocular blood flow has been described elsewhere [21, 4, 10–13]. The objective of this study was to compare the intraocular pressure values provided by the Dynamic Contour Tonometer with those of Goldmann Tonometry and Smart Lens®. Furthermore, the OPA values of the new slitlamp-mounted tonometer were compared to the results of OPA-measurement with SmartLens®. Nineteen eyes of 19 healthy subjects were included in this study. Mean age was 59 years (Range 45–73 years). Exclusion criteria were refractive correction with glasses, corneal scars, previous refractive surgery, eye drops, and glaucoma. IOP was determined using DCT, SmartLens®, and Goldmann Tonometry. Before measurements, the subjects received local anesthesia with eye drops. 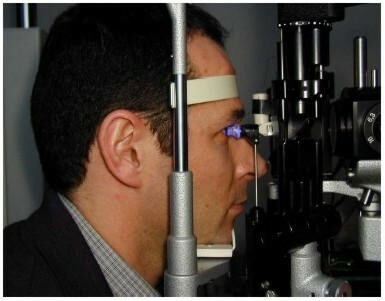 For the measurement with the DCT, the subjects were placed at the slitlamp and the head of the DCT was centered on the cornea similarly to Goldmann applanation tonometry. The measurements were taken in random order. Each subject was measured three times consecutively with each of the three devices. After each measurement on each instrument a rest period of 5 minutes was allowed to minimize the tonographic effects of applanation tonometry. Eyes were examined in random order to guarantee an independent measurement of all instruments. Additionally, OPA was determined from the pulse curves provided by the DCT and SmartLens® devices using the same software algorithm. The day before IOP and OPA measurements a pachymetry of all subjects was performed. The hand-held dynamic observing tonometer SmartLens® with the dimensions of a 3 mirror contact lens incorporates an electronic pressure sensor which is able to measure continously IOP and OPA by applanation of the central cornea. It weighs approximately 25 g. In the center of the lens' contact surface there is a Mylar-membrane-covered bore hole that provides a 2.5 diameter applanation zone. The cavity behind the membrane is filled with silicon oil and is connected with a piezo-electric pressure transducer that is offset in the housing of the lens. The measure of IOP is achieved by the transmissing of pressure through the oil to the transducer when the applanation membrane is displaced during its contact with the cornea. Pressure recordings at the lens are sampled at a frequency of 100 Hz and are transmitted telemetrically to a base unit where the data is stored. In the experimental DCT device used for this study, the contoured tonometer tip had a curvature radius of 10.5 mm and a contact surface diameter of 7.5 mm. The pressure-sensitive area in the center of the contour surface had a diameter of 1.2 mm. The pressure signal from the sensor is sampled and digitized at a 100 Hz sampling rate. A built-in microprocessor provides IOP and OPA values computed from the pulse curve thus obtained. For the purpose of this study, the raw data was transferred to a PC and re-processed under operator control to eliminate potential computational artifacts. Several statistical procedures are carried out to compare DCT and SmartLens® with Goldmann tonometry values. A mountain plot (or "folded empirical cumulative distribution plot") is created by computing a percentile for each ranked difference between a new method and a reference method. To get a folded plot, the following transformation is performed for all percentiles above 50: percentile = 100 - percentile. These percentiles are then plotted against the differences between the two methods . In general, if two methods are unbiased with respect to each other, the mountain will be centered over zero. Long tails in the plot reflect large differences between the methods (Fig. 1). The folded empirical cumulative distribution plot provides information about the distribution of the differences between the DCT and SmartLens® tonometry values compared to Goldmann. If two methods are unbiased with respect to each other, the mountain will be centered over zero. Long tails in the plot reflect large differences between the methods. Additionally, the correlation coefficient Pearson was calculated for the statistical analysis of this study. Intraindividual differences were evaluated using the approach of Altman and Bland . The cornea may be described as a spherical shell constructed from a composite multi-layer material. It resists stretching, but is fairly flexible to deformation. The cornea maintains its shape when pressure on both sides of the entire bulbus is equalized . In order to build an ideal hypothetical device for trans-corneal pressure measurement we consider a container filled with casting resin enclosing the entire bulbus (Fig. 2). The casting resin is put under a pressure p which exactly matches the pressure inside the bulbus. The forces F, generated by the intraocular pressure p, will be exerted through the cornea and sclera on the interface between bulbus and resin. If the casting resin cures under constant conditions and without shrinking, it forms a hollow space which exactly matches the size and shape of the bulbus. The forces F act now on the wall of the hollow space. If we replace a small part of the wall with a pressure sensor of identical surface shape, the sensor will measure IOP acurately. This hypothetical device, which is not practical for obvious reasons, can be replaced with a spherically concave tip that covers only the central part of the cornea (Fig. 3). The radius of the tip surface willl exactly match the radius which the corresponding corneal segment assumes when the pressure on both sides of this part of the cornea is identical. Due to the tangential tensions σt that are generated by the forces F if only part of the cornea is covered, the radius Rc+ΔR is larger than the corneal radius Rc in the normal situation. This exact match of radii in the area defined by diameter d will be termed the contour matching condition. If a pressure sensor with an active diameter smaller than d is integrated flush into the contour surface it measures the exact IOP. The results of the IOP measurement with DCT versus Goldmann tonometry showed no significant difference (P = 0.09; paired t-test). DCT-Goldmann tonometry revealed a correlation coefficient r = 0.97 (P < 0.01, Fig. 4). The mean of DCT was 16.6 mm Hg (median 15.33 mm Hg; +/- 4.04 mm Hg SD). In comparison Goldmann tonometry showed a mean of 16.17 mm Hg (median: 15.33 mm Hg, +/- 4.03 mm Hg SD). The IOP measurements with SmartLens® revealed significant differences from both Goldmann tonometry and DCT. The IOP values obtained by SmartLens® were significantly higher (P = 0.0008) than those obtained with Goldmann tonometry and DCT with a mean of 20.25 mm Hg (median: 19.00 mm Hg, +/- 4.96 mm Hg SD). SmartLens®-Goldmann tonometry showed a correlation coefficient r = 0.86 (P < 0.05, Fig. 5). 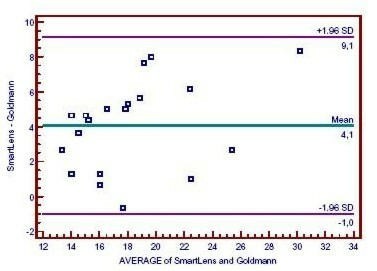 SmartLens® vs. Goldmann applanation tonometer values. 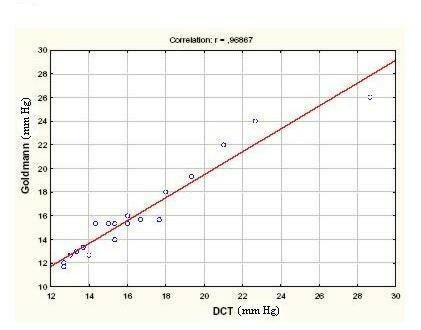 The Pearson correlation for DCT was 0.96 and for SmartLens® 0.87. 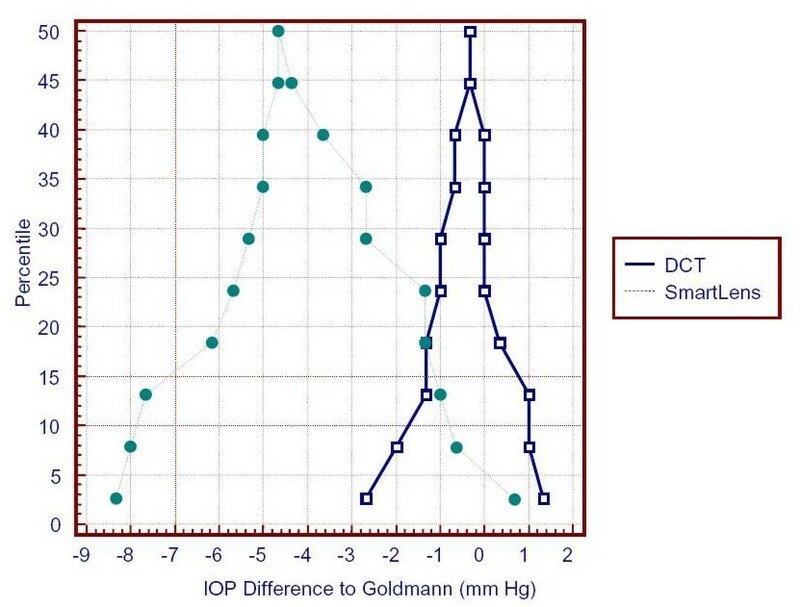 Figure 1 shows plots of DCT vs. Goldmann tonometry values and SmartLens® vs. Goldmann tonometry values. SmartLens® data deviate by 4.1 mm Hg compared to Goldmann whereas the DCT data is centered approximately at zero. Furthermore, the SmartLens® data exhibits large deviations in the lower (<25%) percentiles. Figure 6 and Figure 7 demonstrate a mean difference of 0.42 mm Hg (DCT) and 4.1 mm Hg (SmartLens®) in IOP measurements compared to Goldmann tonometry. The 95% limits of agreement which can provide information on clinical agreement for an individual patient range from -1.56 to 2.4 mm Hg (DCT) and from -1.0 to 9.1 mm Hg (SmartLens®). 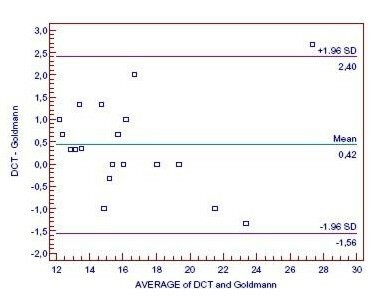 Bland-Altman plot for the comparison of DCT, SmartLens®, and Goldmann tonometry. Outer lines indicate 95% "agreement limits" (d ± 1.96*sd). Furthermore, the OPA values of SmartLens® and DCT demonstrate a significant difference. The OPA measurements of DCT (mean: 3.08 mm Hg, +/- 0.83 mm Hg SD) were significantly lower (P = 0.0003) than those obtained by SmartLens® (mean: 3.92 mm Hg +/- 0.83 SD). Pachymetry revealed corneal thickness within normal range (520 μm to 550 μm). Tonometry is one of the most important methods in ophthalmological clinical diagnostics [1, 2]. Especially in glaucoma the measurement of the intraocular pressure is clinical routine. 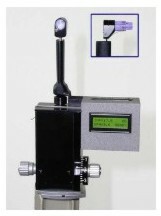 Goldmann applanation tonometry is widely accepted as the international gold standard for the IOP measurement and is the most commonly used method [15, 16]. Nevertheless, the use of this device can sometimes be unreliable [16–19]. Furthermore, the IOP measurement by Goldmann tonometry varies with the thickness of the central cornea, the thicker the cornea the higher the measured intraocular pressure. Thus, the importance of pachymetry in glaucoma patients is evident but controversially discussed in literature [2, 19, 20]. In our pilot study performed with a prototype of the new Dynamic Contour Tonometer we included healthy volunteers without any ocular disease and with normal intraocular pressure of 10–20 mm Hg, a range within which Goldmann tonometry is known to give reliable results on "normal" corneae (i.e. corneal thickness not too different from 520 μm) . In these eyes we found excellent agreement between DCT and Goldmann IOP measurement. In contrast to the contact lens tonometer SmartLens®, which also allows simultaneous recording of the IOP and OPA, the DCT can be slitlamp- mounted similarly to the Goldmann tonometer. The advantage of the slitlamp-mounted measurement is obvious. The new design allows the simultaneous recording of the IOP and OPA in a simple procedure. Previous studies showed that the SmartLens® method is not an adequate substitute for Goldmann tonometry. Troost et al. found an absolute shift of 5.6 mm Hg and an agreement limit in the range of -5.4 to 16.6 mm Hg which has clinical relevance. In our study, we found similar results using SmartLens® for IOP measurements compared to the results of Troost et al. with an overestimation by 4.1 mm Hg with the SmartLens® and agreement limits within -1.0 to 9.1 mm Hg. An explanation for the higher IOP and OPA values with SmartLens® is the design of the contour tip (SmartLens® is based on applanation tonometry, whereas DCT uses the principle of contour matching). 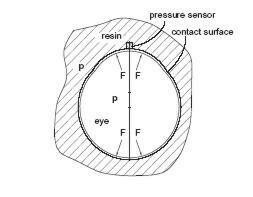 Due to the applanation design of SmartLens®, force distribution of the pressure sensor area is not uniform; hence the pressure sensor may read false high values on some corneae . Furthermore, the contact lens examination for IOP measurement is not observer independent, as other studies demonstrated . The hand held device was found difficult to use by many observers. However, the new slit-lamp mounted DCT revealed no significant difference to Goldmann tonometry. The absolute shift of 0.42 mm Hg is negligible, the agreement limits (-1.56 to 2.4 mm Hg) became obviously narrower, and even the correlation coefficient r of 0.97 is remarkable. Thus, the new DCT device could become an adequate substitute for Goldmann tonometry. Furthermore, tonometry after refractive surgery, e.g. a LASIK procedure, might not be influenced by the new corneal architecture. In this way, DCT measurements are not influenced by changes in corneal thickness [24, 19, 20]. Our data support in a small number of healthy subjects the theoretical expectation that the proposed contour tonometer is capable of correctly measuring IOP compared to IOP measurement with Goldmann tonometry and provides a measurement of OPA, which might be of importance in glaucoma management. The authors would like to thank Hartmut Kanngiesser and Anton Wirthlin, SMT Swiss Microtechnology AG, CH-2562 Port, Switzerland for their technical support and figures.